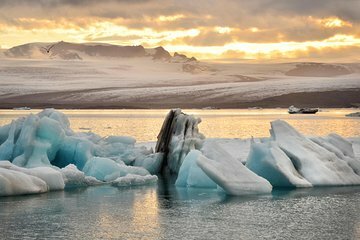 Feast your senses on the frozen majesty of Iceland’s Glacier Lagoon on an enchanting full-day excursion from Reykjavik. With an expert guide, travel to the charming village of Vik to marvel at the area’s spectacular rock formations and black sand beaches. 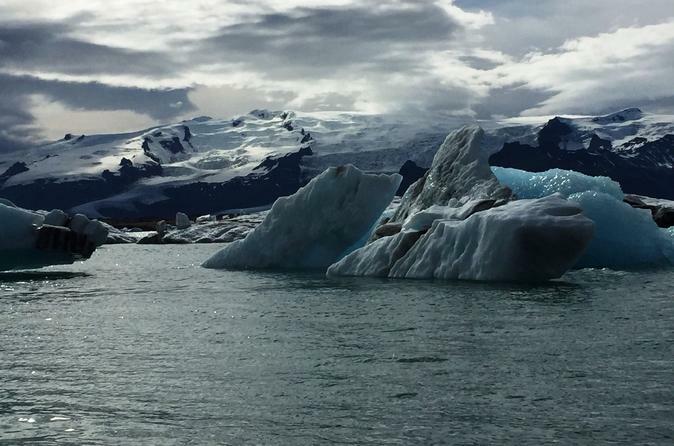 Admire breath-taking volcanic landscapes as you approach the legendary Glacier Lagoon, and then in the summer climb aboard a boat for a cruise around the floating icebergs, before returning back to Reykjavik. This is a long day but so worthwhile and scenic. Lots of stops along the way at waterfalls, canyons and interesting black sand beaches. The zodiac at the glacier lagoon takes you close to the glacier and then around the icebergs in the lagoon, which also has lots of seals! And then a stop at Diamond Beach across the way. Just beautiful! The bus has free Wifi and USB outlets for charging - bring a cord. It makes frequent bathroom and lunch stops. Time flies. The galicer lagoon is amazing, it is shame that we do not have enough time to take the boat ride. I wish the tour guide could give us 15mins more so we can go for the boat ride. We got to see a lot of things, however, the day was very long and mostly driving. If you have the time and don't mind being in the car for about 12 hours of driving, it is a great trip! Our Excursion was memorable, and we had the best weather ever! Our guide was the mose gracious host ever! We're sorry we had to go home! Absolutely amazing, in one day we saw more than I could have hoped for. Excellent driver, knowledgeable and eager to answer all of our questions. Small group, had plenty of time everywhere. I highly recommend this tour! Service was great with Special Tours. Unfortunately we only saw two whales at a distance and puffins at a distance as well. That's the way nature rolls. It was a good experience and I would recommend it, but don't get upset if that day you can't get up close and personal.